Some SUVs have been softened with more sedan-like qualities, pretend to be rugged, or were never all-weather ready to begin with. Not so with the Jeep Cherokee. 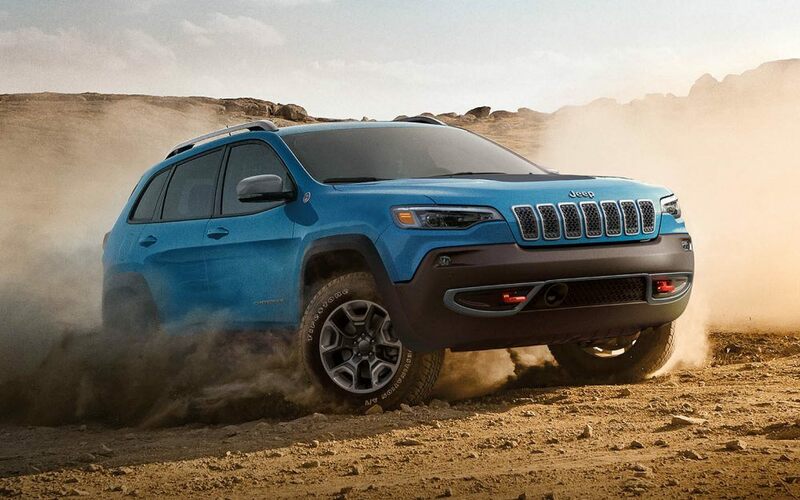 Right from the beginning, it has always been the top compact SUV in terms of actual off-road capability. And for the 2019 model year-ostensibly near the end of its fifth generation of production with the KL model-it is the recipient of several tweaks to keep it fresh in a highly competitive market. Six trims are available: Latitude, Latitude Plus, Trailhawk®, Limited, Trailhawk® Elite, and Overland. 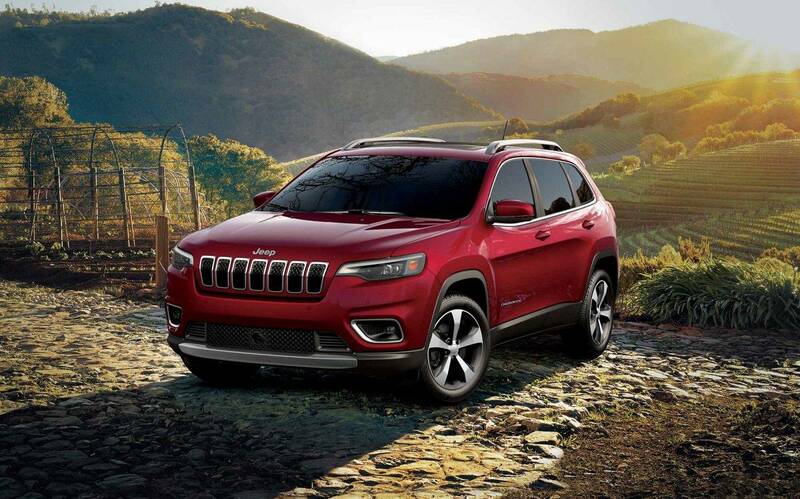 Since the front-end styling of previous KL models has been polarizing, the Cherokee’s manufacturer, Fiat Chrysler, revamped the exterior for 2019, including the fascia, hood, lighting, and wheels. The automatic headlights (with high and low beams), fog lights, and taillights all have LEDs for super-bright and long-lasting illumination. Also standard are roof rails and power heated side mirrors, which also get turn-signal indicators and manual fold-away ability if you go with at least the Trailhawk®. As the designated optimized off-road model, the Trailhawk® trim level further stands out with distinctive features such as an aggressively designed front fascia, red tow hooks, a black hood that reduces glare, off-road skid plates, higher fender flares, off-road tires, and a ground clearance that is heightened to 8.7 inches. A foot-activated hands-free power liftgate is exclusive to the Trailhawk® Elite and Overland trims. (The Limited gets a power liftgate.) All trims have aluminum wheels: 17’s on the Latitude and Trailhawk® trim levels, 18’s on the Limited, and 19’s on the Overland. With seating for five, the 2019 Jeep Cherokee provides 128 cubic feet of passenger volume. Standard cargo volume is measured at 24.6 cubic feet, even though you can fold down the rear seats to expand it to 54.9 cubic feet. Worthy of note is the SUV’s cargo management system, which permits the attachment of various components, such as a storage locker and first aid and roadside assistance kits. Front seating consists of 6-way manually adjustable driver and passenger seats. The Latitude Plus is upgraded with a leather-wrapped steering wheel and shift knob, as well as driver-side 8-way power with 4-way power lumbar support. Appearing on the Limited are front-seat and steering-wheel heating ability, leather upholstery, memory system for the driver’s side (and radio and side mirrors), and 8-way power and 4-way power lumbar support extended to the front passenger seat. The Trailhawk® Elite stands apart from the regular Trailhawk® with front-seat ventilation, and the Overland is the only trim with rear-seat heating capability. 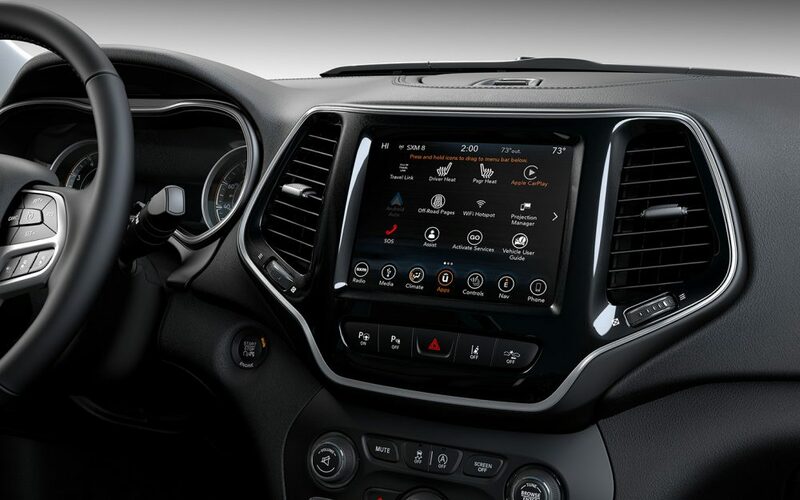 Notable comfort and convenience features on the Cherokee include six-speaker audio, a 3.5-inch black-and-white TFT driver-information display, Android Auto™ and Apple CarPlay™ for smartphone-based control, Bluetooth® wireless technology for hands-free phone operation and audio streaming, a USB data port and audio jack for playing music from mobile devices, and Uconnect® 4 infotainment integration with a 7-inch touchscreen, which replaces the 5-inch in the 2018 model. Upgrading to the Latitude Plus will add a one-year free subscription to SiriusXM® satellite radio. 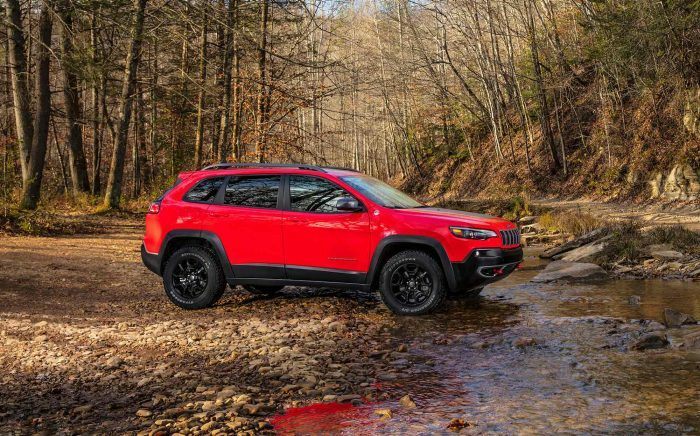 On the Trailhawk®, there are upgrades such as dual-zone automatic climate control, a 7-inch TFT color display (instead of the black-and-white 3.5-inch), and an 8.4-inch touchscreen (in place of the 7-inch). You will need to get at least the Limited if you also want remote start, a garage-door opener, and an auto-dimming rearview mirror, among other enhancements. Only the Overland has upgrades such as a navigation system, nine-speaker audio with an amplifier and subwoofer, and a five-year trial SiriusXM® Traffic and Travel Link subscriptions. 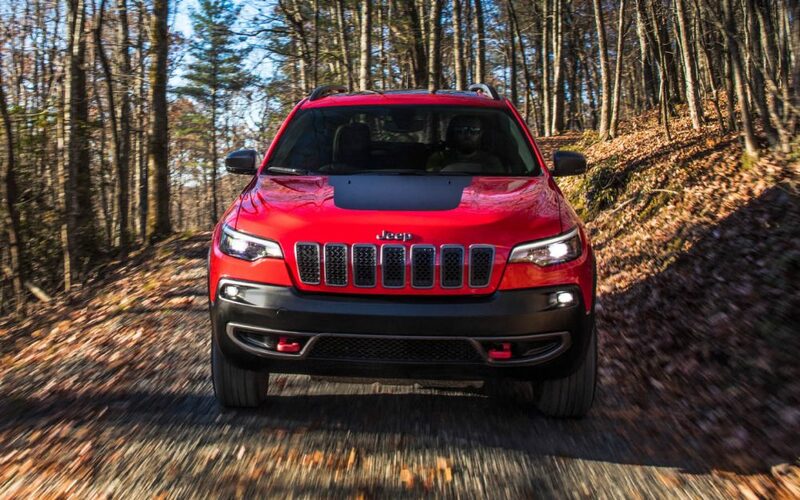 Although front-wheel drive (4×2) and four-wheel drive (4×4) are available on the Cherokee, the Trailhawk® trim level, true to form, stands alone with a standard 4×4 drivetrain, as well as a locking rear differential and a super-low 51.2-to-1 crawl ratio. Also, the MacPherson strut front and four-link rear suspension is tuned to keep the Trailhawk®’s undercarriage further away from damage. Accompanying the 4×4 is the Selec-Terrain® traction management system, which allows you to make powertrain adjustments to accommodate a wide range of road and weather conditions. New for the model year is a more fuel-efficient 2.0-liter Tigershark turbocharged inline 4-cylinder (I4) engine that is available on all trims but the base-level Latitude. The new engine makes 270 horsepower and 295 lb-ft of torque. Still standard is the 2.4-liter MultiAir® I4, which produces 184 horsepower and 171 lb-ft of torque. The Trailhawk® and other upper-level trims roll with the 3.2-liter Pentastar® V6, which churns out 271 horsepower and 239 pound-feet of torque. Standard with all three engines are a 9-speed automatic transmission and stop-start technology. For cushioning and restraint in the event of a collision, the 2019 Jeep Cherokee is equipped with dual front impact airbags, driver and front passenger knee airbags, dual front seat-mounted side-impact airbags, and a pair of side curtain airbags. Also standard are electronic stability control, LED daytime running lamps, all-speed traction control, a rearview camera, speed control, electronic roll mitigation, an accident response system, hill start assist, and a theft-deterrent system. Blind-spot and cross-path detection is added on the Trailhawk® and higher trims, and a security alarm appears if you get at least the Limited. Notably, the Trailhawk® trim level is unique with the addition of hill descent control for maintaining a safe speed while driving down a slope. Want to know more after reading this review? Ready to test-drive the 2019 Jeep Cherokee near Denver Colorado? Then come see us at Pollard Jeep of Boulder near Denver Colorado. Although based in Boulder, we are known for serving Denver residents, in addition to those in Boulder and the surrounding areas. 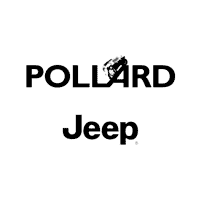 Pollard Jeep of Boulder has been known for serving Denver with high-quality Jeep vehicles for over 45 years from the same location. For an appointment with one of our sales specialists at Pollard Jeep of Boulder near Denver Colorado for review, known for serving Denver customers, call us today. Go beyond this review by finding out more about this vehicle and driving off with something that has your preferred features and options.